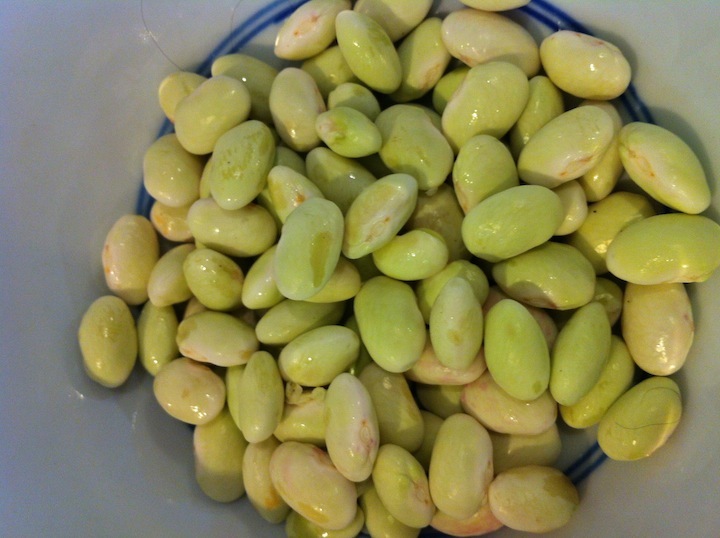 It took me a while to actually buy the beautiful fresh shell beans that appear in the market throughout the summer. I read about how easy they are to work with and how delicious they are, how it's hard to go back to dried beans afterwards. And I was tempted, but really? Would I do all of that work for beans? Yes I do and it's not really much work, especially if you do it with your kids or a friend. It feels good to work with food like this, to start with it in its unprocessed state. It gives me the illusion that I live in a better and healthier way than I actually do. 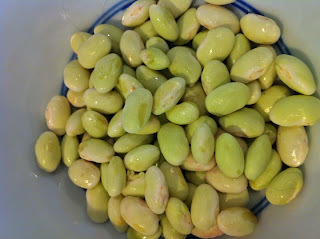 And what I read is true - shell beans are remarkably easy to work with and are quite versatile too. You can use them however you would, well, beans. Not sure what kind these are, although from the outside I thought they were cranberry beans. 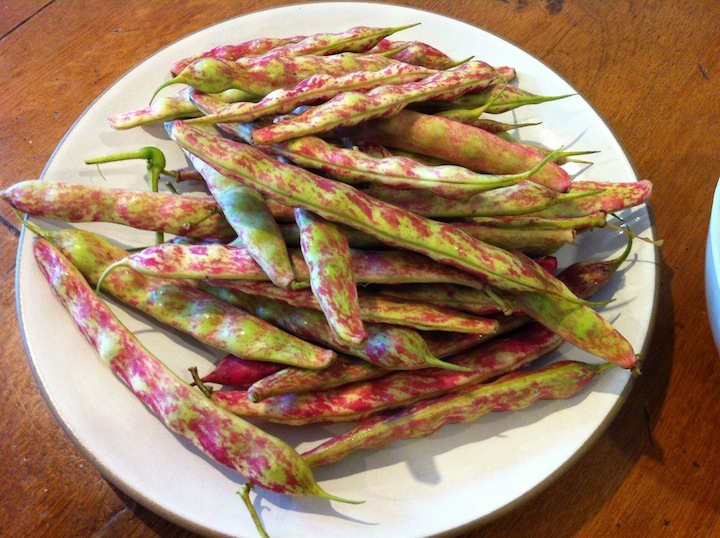 But mostly they were light green in color, not the white with red veins that I associate with cranberry beans. No matter, these were beautiful too. I like to braise them in just enough liquid to cover them and then eat them as a side vegetable. Or with bread as a main dish. Perhaps the most classic of seasonings for the braise is rosemary and garlic, and then finished with olive oil. You won't go wrong with that, but that feels wintery to me. On this late summer evening I imagined something different, something more summery. I had a crisp red pepper in the house and a fresh bunch of parsley, and so it was. Sliced onions sweated in a heavy bottomed pot, a small clove of finely chopped garlic too, and some diced celery. I added two small anchovy fillets because it seemed like a noble thing to do. 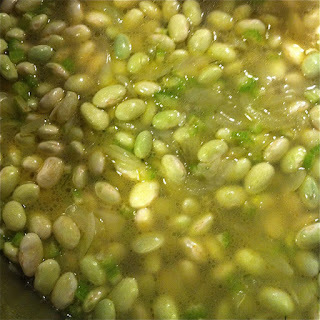 When everything was aromatic and enticing, I added a small glug of sherry vinegar, a bit of salt, and then enough water to just cover the beans. After they came to a boil, a bay leaf, some coarsely chopped sweet red bell pepper, reduce the heat and cover almost all the way to braise for 20 minutes. I don't know exactly how long until they're done because it depends on the temperature, the kind of pot, and the kind of beans you're using. I start checking at about 20 minutes. When they are almost as tender as I want them to be I uncover the pot and raise the heat again to reduce the liquid bit. 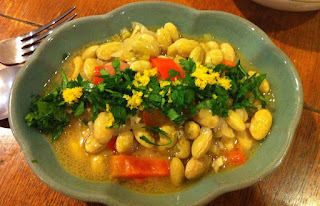 I finished the dish with a small glug of good olive oil, chopped parsley, and lemon zest. The peppers never got as pliable as I had hoped for, which I take as a sign of their absolute freshness, not my incompetence. You may see things differently and that's fine. My daughters and I ate these beans with rice and they was nary a complaint. In fact, the younger one insisted on putting on her own parsley and lemon zest. What to drink with this dish? This is not a difficult problem, as i think it would be hard to offend this dish with wine. 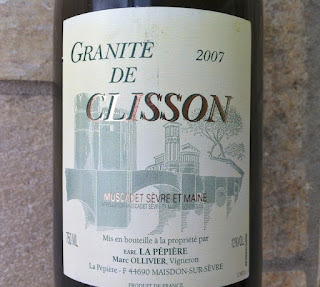 I went with the 2007 Domaine de la Pépière Muscadet Granite de Clisson, $22, imported by Louis/Dressner. This is completely wrong of me because you have to drink Muscadet with seafood, preferably oysters. It's not allowed to go with beans or meat or anything like that. Seafood, that's it. One really should follow the rules, but I did not. But I had a half bottle remaining from the previous day and those rules are, of course, ridiculous. The wine is developing beautifully! It exceeded my expectations on both days. At first it was beautiful as a wine, with lemon and leesy richness and crystalline purity, long and fragrant on the finish. Just a detailed, balanced, and delicately articulated very fine wine whose fineness belies its power. 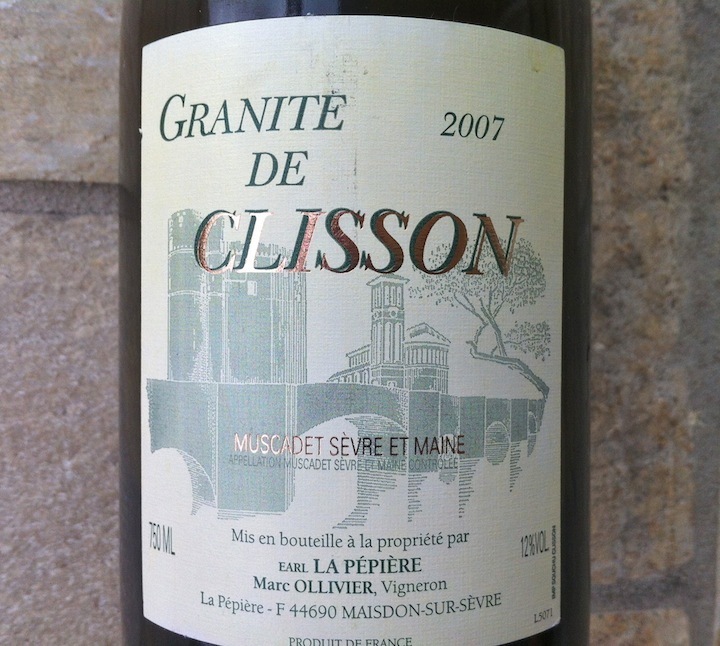 And on the second day it becomes more recognizable as a Muscadet with briny notes emerging, and more of a leesy sense on the finish. 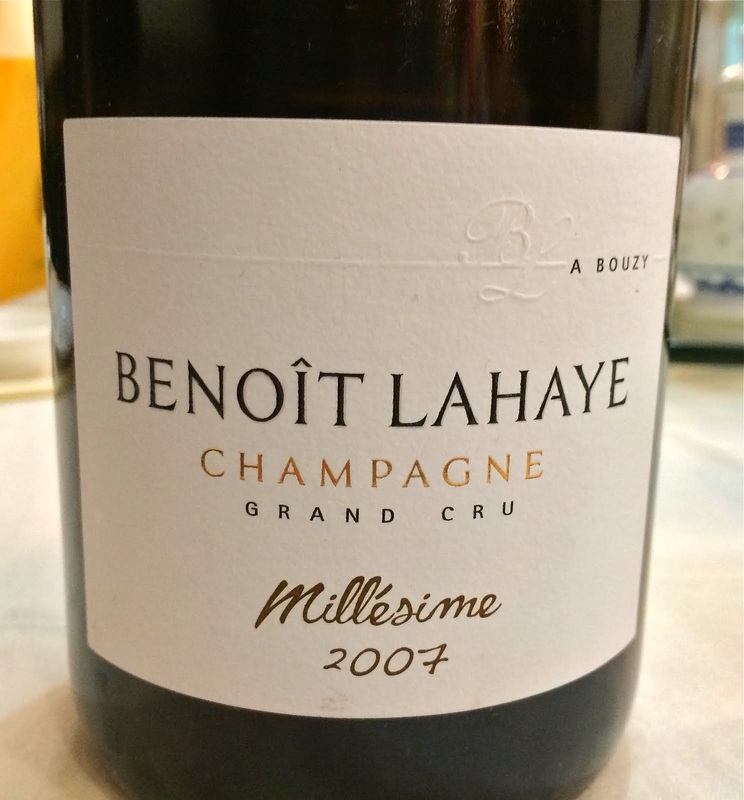 This is excellent wine and although earlier in the week I said that I have no idea what will happen to the wines in my cellar, I'm betting on this one to be gorgeous at every point over the next 20 years. Recently I had the rather disturbing realization that almost half of the bottles in my cellar are wrong. They are not wines that today I would bet on to give me the pleasure that I look for in mature wine. There's nothing terrible in there, but there are plenty of wines in which today I would not make the investment of money, cellar space, or time. It got me thinking again about this whole question of aging wine. How should I decide on the wines I want to age? Let me be clear - I am not asking about which mature wines I want to drink. That's easy, I would say. 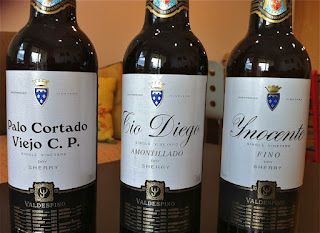 I want to taste any and all mature wines so I can learn more about what to expect from various young wines as they age. 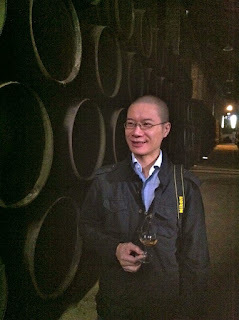 I'm asking about about selecting young wines for the cellar. Keith Levenberg wrote something interesting about this a little while ago, telling a story about buying 6 bottles of 2001 Bernard Levet Côte-Rôtie La Chavaroche, drinking one and not being moved, and then "disposing" of the rest by bringing them to dinners with people who don't care which wine they are drinking. And then he drank a bottle of the same wine but from the 1983 vintage, and was moved. Enough to bring newer vintages of La Chavaroche back into his cellar. I have never tasted a young version of a classically made and age-worthy wine, and then aged that wine to maturity. I simply have not been collecting wine long enough to do that. I have never tested my own ideas about which wines in time will become what I'm hoping for, and which will not. I don't know if I'm right when I drink a young wine and then think "yes, this wine should age well." Think about it - you have to have been collecting wine for 25 years if you've tasted a great old bottle of Burgundy, Bordeaux, Barolo, or northern Rhône wine that you bought upon release. It's rare to be in the company of such a person. I only rediscovered wine about 7 years ago. Who knows if I will still care about wine in 25 years? 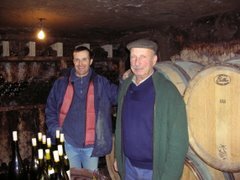 Will I drink my 2007 Bernard Baudry Les Grezeaux with the same delight that I felt in putting it into storage, planning for that day? I'm just guessing every time I put something in my cellar. I'm more educated now with my guesses, but I am still guessing. I actually feel pretty good about what I put into the cellar these days. Some of this is simply understanding what it is that I like in wine. For example, I cellared almost nothing from the 2009 vintage in Burgundy. 2009 was a ripe vintage that gave big wines and that is not the thing that excites me about Burgundy. I saved a few nice bottles from 2007 and 2008, though. Wines from those vintages tend to have less ripeness and body, but while very young they showed a balance, clarity, and detail that I found compelling. Will that translate to mature wines that are exquisitely balanced, thrillingly detailed, and terroir-expressive? Honestly, I have no idea. I do like the idea, though, of cellaring wines that today show some of the characteristics that I want to be amplified in maturity. Another thing that I'm enjoying lately is thinking of all of the recent vintages I've had of wines that I actually have built some familiarity with, and trying to decide which recent vintage is the one I would cellar if I had to choose only one vintage. This is not always easy to do. For example, I've drunk several bottles of Foillard Morgon Côte de Py each vintage since 2006. I was in love with the 2007 and felt that it would age well so I saved a few bottles in the cellar. But then one night a couple years ago I was hanging out with Joe Salamone, one of the wine buyers at Crush, a lovely guy whose thoughts on wine are always smart and well-considered. I asked him what he thought about the 2007 vintage of Foillard Côte de Py, hoping he would confirm my belief. He said that he liked the wine a lot, especially for short term drinking, but that he didn't think the 2007 was a good candidate for long term aging. Hmmm. So maybe my read is wrong on age-worthy Foillard Côte de Py. I've since drunk all of my remaining bottles except for one, and it's true - it is already showing mature notes and it feels completely harmonious. Still, I think I need to see what will happen with another 5 years or so. You know, to confirm or refute my own hypothesis. The 2010 Foillard Morgon Côte de Py, by the way, is the recent vintage that I would now bet on for best future satisfaction. 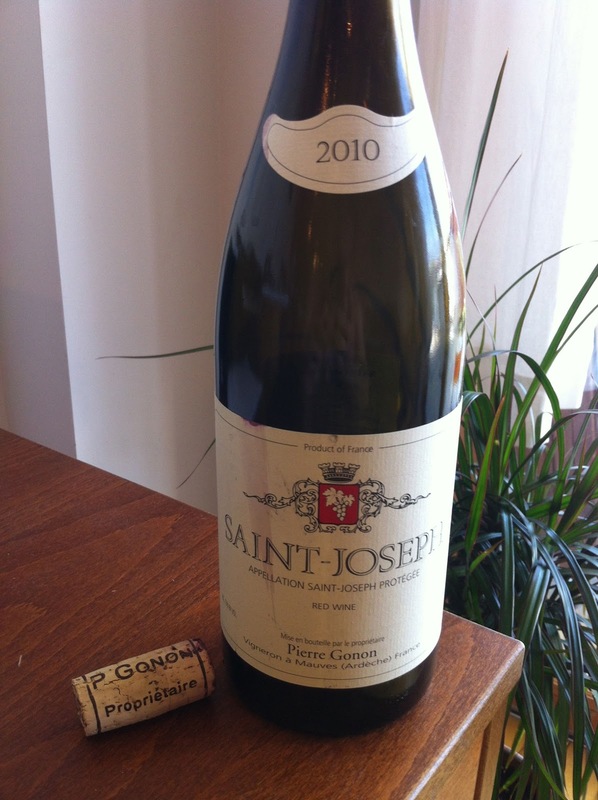 Another example is Pierre Gonon's great St. Joseph. I've had several bottles of each vintage since 2006. Hard to pick the one for the cellar. Definitely not 2008 or 2009 - too dilute and too ripe respectively. 2007? It certainly had great energy and really strong acidity. 2006? So well balanced. I would pick 2010 if I had to choose only one. I drank a bottle last week and it's just a fantastic wine that shows great clarity and detail, good acidity and structure, and although it's a bit rough and raw right now, it shows lovely balance. It will be fun to see what happens with these wines down the road, as I have a bottle or two of each vintage in most cases. I hope I still care about this by the time they mature, and who knows, maybe the 2008 Gonon will turn out to be best in 15 years. The other night a generous friend came over for dinner. 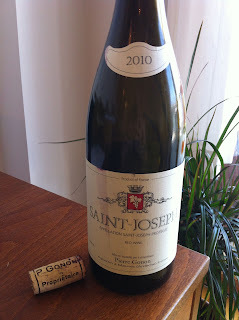 He told me earlier in the day that he would bring "an interesting Burgundy to try." That works well because I happen to love Burgundy wine. He arrived and produced a bottle of wine by one of the most famous names in the history of Burgundy, in all of wine, I would say. I laughed out loud when I saw the wine. I mean really - to have the opportunity to drink a bottle of wine by Henri Jayer is an amazing thing. Jayer started farming vineyards, mostly in Vosne-Romanée, for 50 years or so. He never bottled all that he harvested, as a lot of the land he worked was owned by others, but he of course bottled his own wine too, and it was legendary during his time. Prices went through the roof after Jayer died in 2006. For his top wines - the iconic Crox Parantoux, Richbourg, and Échézeaux - each bottle begins in the thousands. Multiple thousands. This year a case of 1985 Jayer Cros Parantoux sold for, um, $265,200 at auction (more than 22K per bottle for those without a calculator). I was not the person who bought it, in case you were wondering. Until the other night I had never tasted a wine by Henri Jayer. Most of us haven't, even those of us who were into wine back in the 70's when top Burgundy cost hundreds, not thousands of dollars. There never was very much of the wine. Now that bottles are astronomically priced it's just an unlikely thing, to drink a bottle of Jayer. There are several wines like this that immediately come to mind and sadly, many of them are Burgundy wines. What would it be like to actually drink one of these wines? Really, try to imagine it for a moment. Someone shocks you with a bottle of Jayer, or something else rare and iconic. Something you otherwise would never have the chance to drink. Something you've heard about, read about, wondered about, and never expected. There is no question that the experience of drinking such a wine would be glorious. But what about the part where you try to figure out if you like the wine, and how much. What about the part where, regardless of whether or not you like the wine, you try to figure out if it is a good wine. Wouldn't it be easy for your judgement to be clouded by the fact that you are drinking Henri f*#ing Jayer?!? I've heard wine pros and other folks too say that their judgement is not clouded in these situations. I believe this but only if that person has the breadth of drinking experience to make this possible. Most of us don't have that kind of experience, and we are only human, are we not? You'd have to be a hater to walk into your first bottle of Jayer and dislike it. So, my generous friend brought with him a bottle of 1993 Henri Jayer Bourgogne, Jayer's most humble wine. 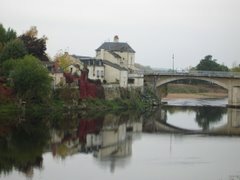 But Jayer, no less. And I will tell you that I loved the wine before it came out of the bottle. Okay, that's not true, but I was definitely all set to love it, so take everything I'm about to say now with a grain of salt. This was not even close to being one of the top Burgundy wines I've ever had. 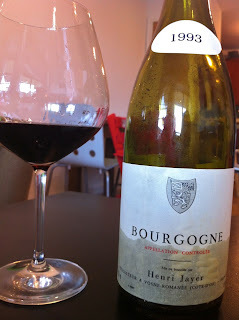 But it was among the best Bourgogne wines I've had. I think it compared quite favorably to many of the best Villages level wines I've had. It had a delicacy to it that contrasted with the pungent and smoke-inflected flavors. Especially on the second day (my friend left me the bottle!) 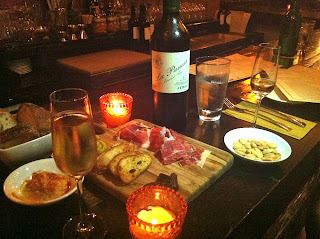 the wine had this sheer sensation to it, this elegant and lacy texture, and the flavors were more detailed. I wanted to find Vosne spices, but mostly I didn't. Something in the wine, the powerful and almost muscular way the wine delivered its smells and flavors, made me think of Gevrey or Nuits-Saint-Georges. But I have no idea where the grapes for this wine came from. 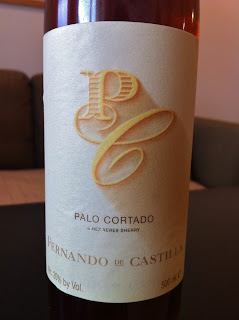 In the end I really liked the wine, I could tell that it was a very high quality wine, and it was thrilling to drink. Jayer Bourgogne was very good. 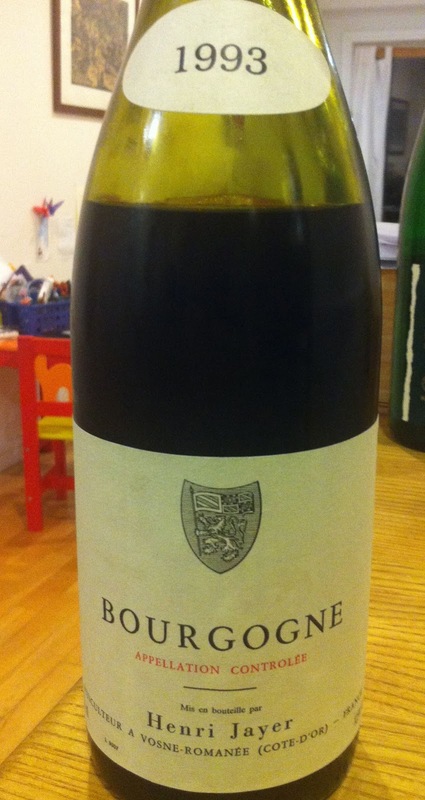 but a lesson in terroir in that it in the end was Bourgogne, perhaps with some villages fruit in there? But it's hard to make a grand cru wine from Bourgogne site, even if you're Jayer I guess. That bottle is too weighed down by expectations. When it was made it was supposed to be a good, easy-drinking yet high-quality wine, like Lafarge Passetoutgrains or Dugat Bourgogne. Now, though, it's expected to be Jayer. Amazing that it's happened so quickly, but summer is basically over. The good news is that fall happens fast too, and after Thanksgiving it's just a few winter months, and then it's almost summer again. So yes, it's almost next summer already, and that is exciting. This time of year I eat tomatoes shamelessly. Tomatoes of all colors, shapes, and sizes, at any time of day, with any combination of foods, and prepared in all sorts of ways. I try to be creative and still, some of my favorite late summer tomato dishes are the classics. Really, I ask you, could you turn down a well-made BLT? 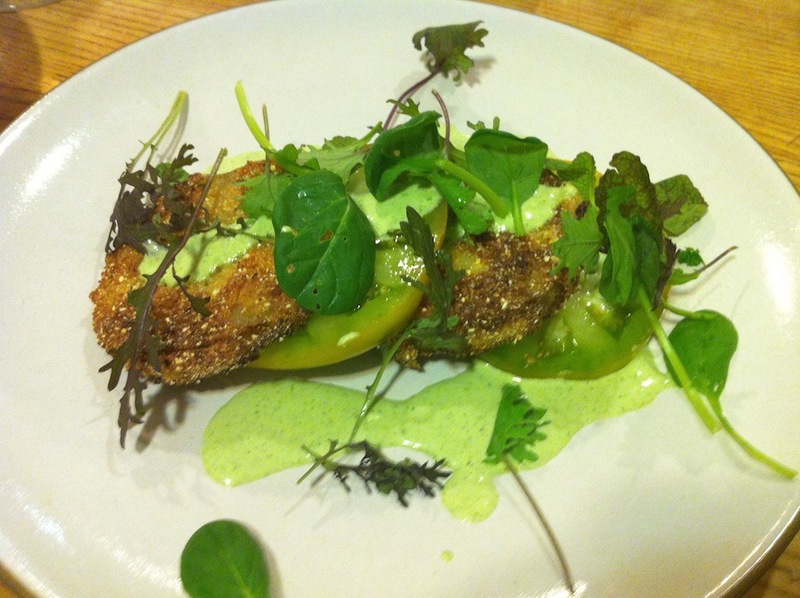 Could you refuse a plate of fried green tomatoes? I should think not. 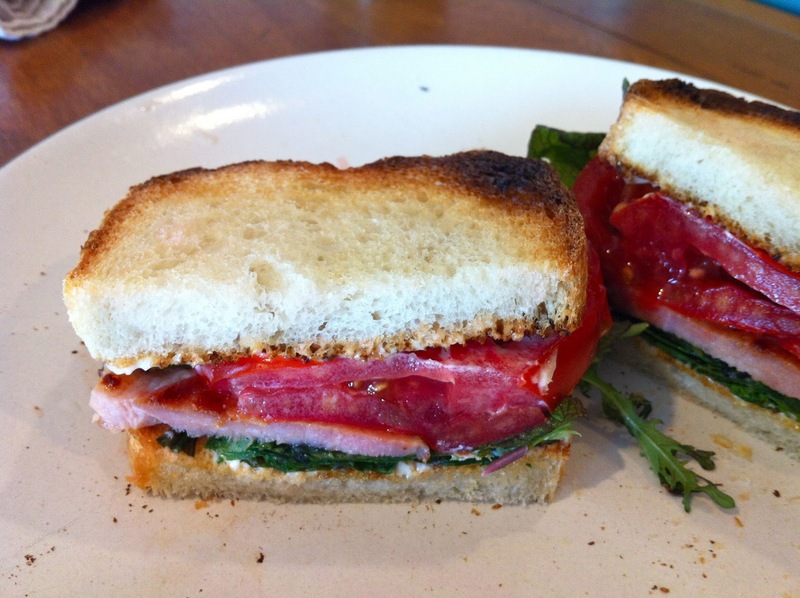 The BLT, just in case you require a little tomato inspiration. I like mine on good white bread. And high quality thick-cut bacon is a must. I'm using Lou's Natural bacon these days, and it's very delicious and not too fatty. But in the end, this sandwich is about the tomato. 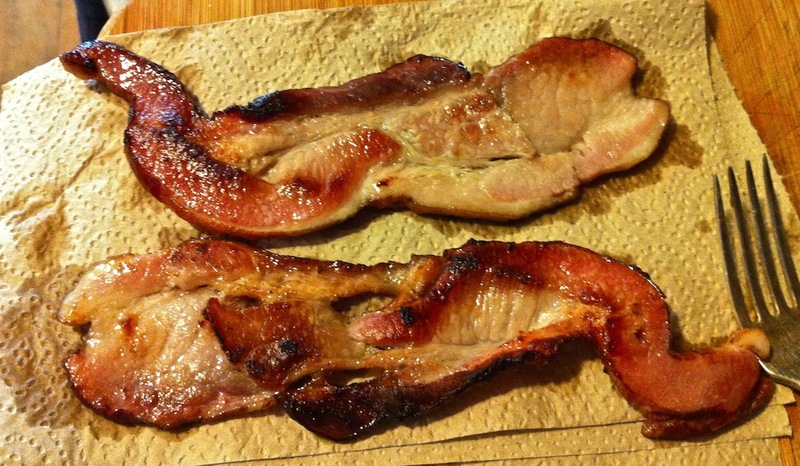 It has to be flavorful enough so that it actually offers contrast to the smokey bacon. I've used heirlooms of various colors on a BLT and while I wouldn't kick any of them off my plate, it is the classic orange variety that gets me on a BLT. 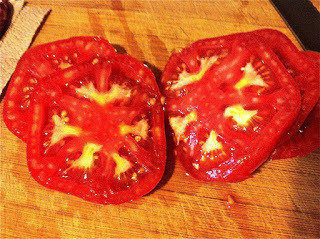 This is a Ramapo tomato grown by star New Jersey farmer Bill Maxwell and it is not to be trifled with. It isn't as firm as some others and therefore gets a little sloppy when in sandwich, but it is well worth it for its wonderful fresh essence-of-tomato flavor. Really though, this is a messy tomato and is better eaten at home where you can get all sloppy with it. 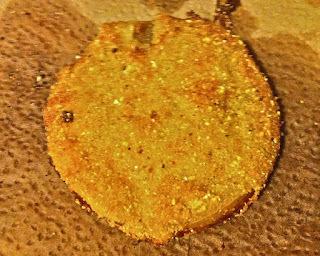 Fried green tomatoes require a little more time but not much more effort. You are slicing green tomatoes to about a half inch thick, coating them in flour, dipping them in a mixture of buttermilk and egg, then dredging in seasoned cornmeal. There are many variations here and all work fine. 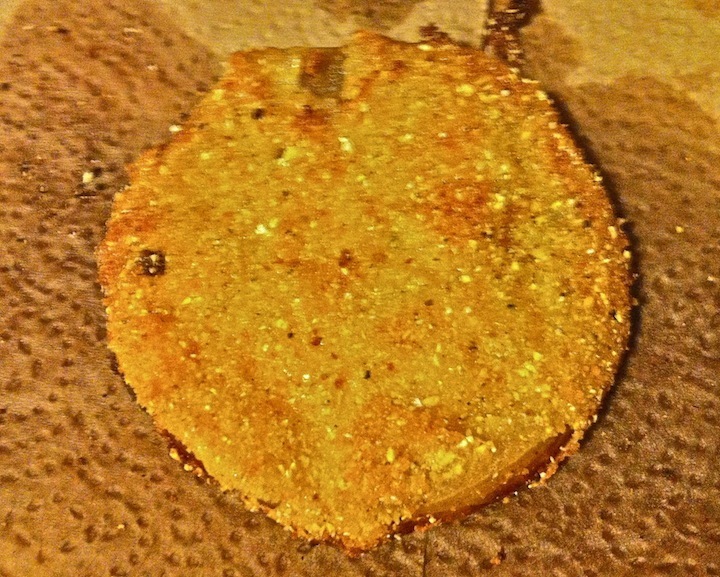 I like to use breadcrumbs as a solid third of my cornmeal mixture because the crust stays together better after cooking. And I season with salt and pepper, nothing more. I'm sure there are at least 146 correct ways to do this, so do what feels right to you. After the coating, the dipping, the dredging, and the frying, the hard part of your work is done. Now it's about choosing a vehicle. Fried green tomatoes are delicious as a side dish, but I like them to get top billing. Last week I served them as a first course, interspersed with slices of a beautiful ripe Green Cherokee tomato and topped with green goddess dressing. Green goddess dressing is ridiculously delicious and pretty easy to make, but that's for another time. This was a good dish, by the way. My friend asked for seconds and happily cleaned his plate. 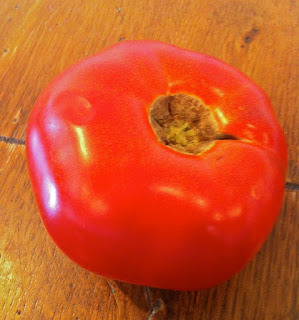 What to drink with this sort of late summer tomato goodness? Anything really, from an acidic white wine to a light red wine. I've been enjoying rosé with these dishes. 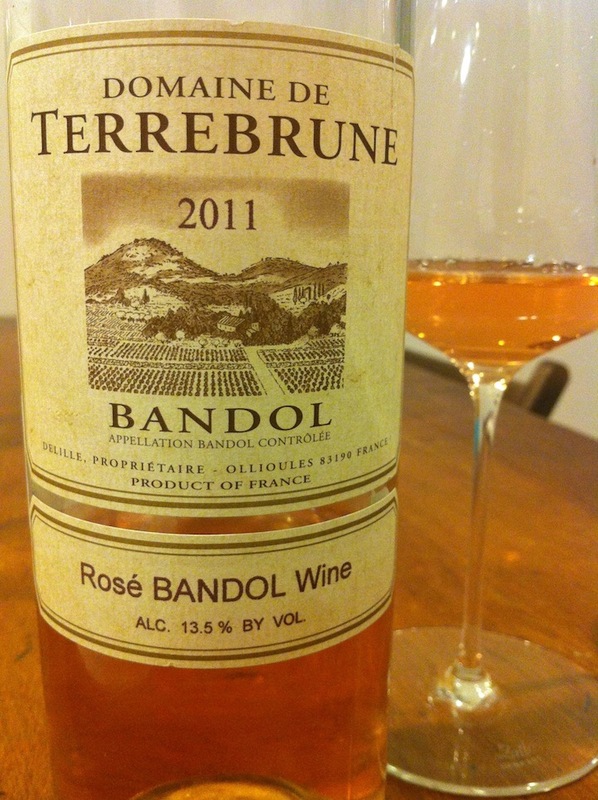 A good Bandol rosé, the 2011 Terrebrune Bandol Rosé, $32, for example, imported by Kermit Lynch, has the complexity, depth of flavor, and the body to stand up to this hearty food, and also the acidity and fresh fruit to cleanse the palate. And there is something about the way Mourvedre rosé works with bacon...But I drank the leftover half of the less ambitious 2011 Domaine Les Fouques Côtes de Provence Rosé Cuvée de L'Aubigue, $14, David Lillie/Chambers Street direct import, with a BLT today and it was great. Then again, I don't need much of an excuse to drink good rosé, especially now that it is almost next summer.